Ralph van Dooren made a surprise move in March 2006. 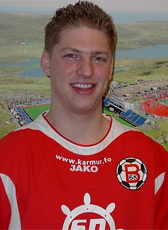 He plays as first Dutchman in the football league of the Faeroer Islands. He signed for B68 Toftir. Van Dooren has not extended his one year contract at the Faeroer. He followed his girlfriend to Denmark where he signed for second division club FC Hjørring for the rest of the season 2006-2007. In February 2008 he returned to the Faeroer to play at B68 again. The competition ended in October 2008. he returned home and started playing at the (Hoofdklasse) amateurs of EVV Echt.